The Kansas River corridor is an incredible place for bird watching, especially in reaches with well developed riparian forests, sandbars, shallow back waters and wetlands. The most common birds that we see during float trips are geese. 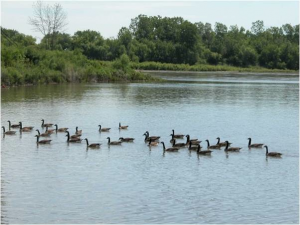 The goose of the Kaw is a former migrant that has become a year-round resident and breeder, the Canada Goose. During the summer you can see families of geese with several offspring attended by their mothers and fathers. 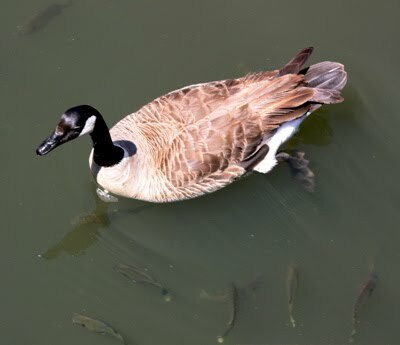 During mid-summer (July-August) you may encounter groups of Canada Geese along the river that consist of a mother and father and their nearly full-grown, but flightless offspring. These birds will not fly away, because the young birds have not mastered that skill, so they will often try and retreat into the woods along the river to get away from you (young birds can be as big as their parents while not yet knowing how to fly). Please give these families some space since the young can become separated from their parents when they panic. Canada Geese symbolize spring and fall along the river as large flocks migrate overhead in their characteristic V shape, honking to one another as they fly. This behavior has given Canada Geese the nickname, “honker”. Another common goose that sometimes joins Canada Geese during migration, but is not a local breeder, is the Snow Goose. Snow Geese are high Arctic breeders and are all white with pink beaks and black wing-tips. They have a dark form, called Blue Geese, which have dark bodies and are probably evolving into a new species. 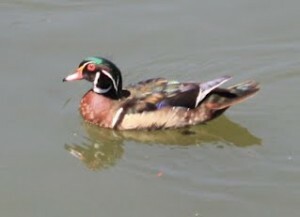 The most common duck seen along the Kaw is the Mallard, the quintessential prairie waterbird. 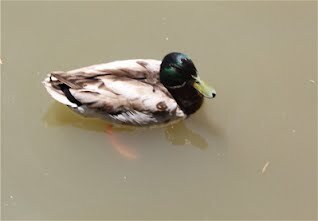 Mallards evolved to nest in prairie potholes, the natural ponds of the American prairie, and has either invaded or been introduced into most areas of North America where forests were cut down and replaced with grassy areas surrounding small bodies of water. Male mallards are easily recognizable, with their deep green heads with a white neck ring, bright yellow beaks, and bright orange feet. Female Mallards share the bright orange feet with their mates, but their heads are brown and they have an orange bill with dark smudges. Females are less conspicuous because they sit on the nest, and camouflage helps both them and their eggs to survive. Outside of the breeding season (fall and winter) male Mallards molt into an “eclipse” plumage, which resembles that of the female. The final species of duck that breeds locally is the Blue-winged Teal which occurs primarily in small marshy ponds and backwaters. Teal are small ducks that fly very fast, and the males do not quack, but produce a high, peeping whistle. In flight the sky blue wing patch is very distinct, but this is hidden when the bird is on the water. Among the ducks that you are likely to see during migration, the Bufflehead is especially obvious because the males have a bright white “scarf” on a round black head. Other similar sized ducks that you might see with these males which have a white ear spot (but no “scarf”) are females or juvenile males. Do not confuse Buffleheads with Goldeneyes, which are another species of duck where the males have a white spot in front of a conspicuous yellow eye. A very different type of duck is the Common Merganser which have a long narrow profile compared to other ducks. Males are mostly white with black backs, green heads, and a narrow red bill. Females of this species are gray with rust colored heads and white throats, and look like males that have started to rust in the rain. If you are fortunate, you might see the most magnificent of waterbirds, the Tundra Swan. Tundra Swans used to be called Whistling Swans, because of their high-pitched calls. These large, long-necked birds are sometimes seen flying overhead in flocks, but the lucky observer may actually see them on the river itself. 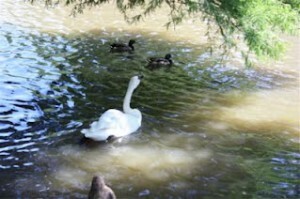 Two smaller types of aquatic bird can regularly be seen on the Kaw and its surrounding waters. The American Coot is sometimes mistaken for ducks, but they have a white chicken-like bill and an all black body. They swim a jerky fashion. They are one of the few species of birds where the chicks are more brightly colored than the adults, with bright red beaks and orange and red heads. The other small bird on the river is the Pied-billed Grebe, which is a diving bird with a dark body and gets its name from its white bill, which is “pied” by a black stripe that crosses the middle from top to bottom. Pied-billed Grebes rarely fly and if pursued dive under the surface and swim underwater. The only other species that do this are cormorants and mergansers, both of which are much larger. Cormorants are genuine aquatic birds, and the species you might encounter along the Kaw is the Double-crested Cormorant. Double-crested Cormorants are dark bodied with a conspicuously yellow throat and facial area. They are usually seen swimming low in the water because their plumage is not water repellent. The other place you see them is perched on dead trees or sandbars with their wings spread, which is their way of drying out their feathers after a period of diving and swimming underwater. If you see them swimming in clear water the air bubbles trapped in their feathers make them look like they are covered with silver. There are several species of gulls that can be seen on bodies of water or around plowed fields in Eastern Kansas. The larger of the two most common species, especially in winter and spring, is the Herring Gull, which is the quintessential sea gull. Usually you see adults along the Kaw, but gulls occur in several different plumages during their lives, from an all-brownish gray color in first year birds that changes over a four year period into the elegant light gray and white birds with black wing-tips that represent the adult plumage. The most common gull species in Kansas is the Ring-billed Gull, which is not really a sea gull in any sense of the word because it breeds and spends almost all its life on bodies of freshwater throughout the central US and Canada. Ring-billed Gulls can be distinguished from Herring Gulls because they are smaller and their legs and feet are yellow, unlike the pink of Herring Gulls. Also, their bills are a paler yellow with the black ring near the tip that gives them their name. Overall Ring-bills are slighter and more delicate-looking than Herring Gulls. They also have higher pitched calls than Herring Gulls, which have the classic “seagull sound”. At first you might confuse these two species, but once you have looked closely the differences become obvious. Terns are smaller and more delicate looking than gulls and their flight is very distinctive, looking like a cross between bat and very large swallow. Like swallows and other birds that hover, Terns have forked tails. The tern you are most likely to see is the Least Tern. Least Terns breed in Kansas and hang out on sandbars. One major difference between gulls and terns is that terns fly or hover above the water and then dive for the small fish that are their primary food. Other species of tern that migrate through this area are Forster’s Tern and Common Tern. These two species are both larger than the Least Tern and both have red beaks and black caps that go all the way to the bill. In contrast, Least Terns have a white forehead that separates their black cap from their bill. One of the most dramatic birds along the Kaw is the Great Blue Heron. This large bluish-gray bird with a rusty colored neck, white face, and long yellow bill is in many ways the spirit of the Kaw. You will often find it wading through the shallows looking for frogs and fish, or flying silently overhead, its long slow wing beats regal as its long legs trail behind. 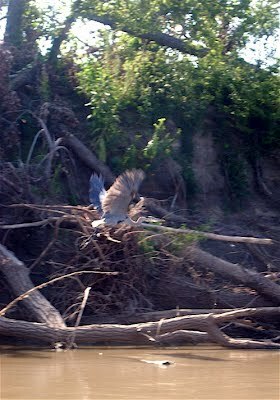 Great Blue Herons nest high in trees and fly back and forth from their nests to their feeding areas. The other common heron of the Kaw is rarely seen, but very interesting. This is the cryptic and solitary Green Heron. This beautiful, chicken-sized bird has orange-yellow legs, black crown feathers over a chestnut colored face and neck, a dark bill, and a dark back that shows highlights of iridescent green that gives this species its name. Green Herons are typically seen perched on a branch or wading along the edge of backwaters where they wait patiently for fish. 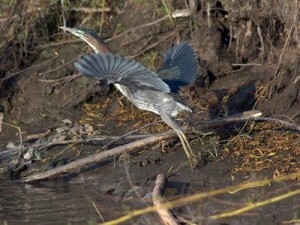 If startled Green Herons squawk loudly, which is often how they are first detected. Green Herons are known to use bait to catch prey, by dropping small bits of food into the water and catching fish and crayfish that are attracted to the bait. In fall and spring you may also see the tall white Great Egret along the Kaw. This tall white bird, with long black legs, and a bright yellow bill is hard to mistake for any other species. There are many species of shore birds that can be seen along the Kaw and the fields that surround it, especially during spring and fall migrations. One species of sandpiper that breeds in Kansas and might be seen on sandbars is the Spotted Sandpiper. During the summer breeding season, this species is the only sandpiper with round black spots on its chest to go with its brown back and orange-pink bill. Spotted Sandpipers are also distinctive because their tails and rear ends bob up and down as they walk. The commonly seen, and more often heard, Killdeer is the most common breeding species of plover in Kansas, although it is rarely seen on the Kaw itself, and more often in fields or even on golf courses. Killdeer look like they are wearing sunglasses across their white faces and they have two conspicuous black bands across their white chests. The Belted Kingfisher digs burrows into the banks of rivers and streams where it raises its offspring. With its white front and bluish head and back with a white color and belly and a heavy dark bill, kingfishers often announce their presence with their loud rattling cries that sound like a very large cricket. Kingfishers dive from perches above the water to catch fish under the surface. 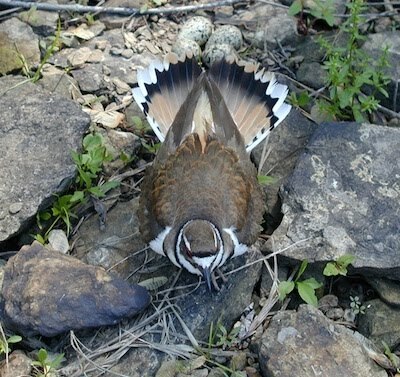 Males lack the rusty belt that gives the species its name, but both male and female have conspicuous blue-gray chest bands and prominent crests. Bald Eagles nest in tall trees along the Kaw in huge nests it builds from sticks. This species also spends the winter along the Kaw, especially in areas where they can feed on fish, as they do below Bowersock Dam in Lawrence. Bald Eagles are predators on fish, but when fish are hard to find they will switch to hunting water birds such as ducks, geese and gulls. Not all Bald Eagles have the conspicuous white head and tail; immature Bald Eagles lack these distinctive marks. Immature Bald Eagles show a patchwork of mostly brown feathers with a few white feathers occurring all over the body. It takes five years for a juvenile to become an adult, which is one reason the species took so long to recover from its population decline due to DDT in the 1950’s and 60’s. Bald Eagles have a high-pitched piping sort of call that sounds pretty silly coming from such an impressive looking bird. In flight eagles are very large with broad wings with long primary feathers that look almost like fingers. Another conspicuous bird that feeds on fish, but spends the rest of its time high in trees or even perched on power poles is the Osprey or “fish hawk”. Ospreys can be distinguished from eagles because they have white breasts and bellies and a dark eye stripe that runs all the way to the beak on their otherwise white heads. They also have long legs that they use to pluck fish from just below the surface. Bridges provide the perfect place for Barn Swallows, which are the most obvious species of Passerine or perching bird seen on the Kaw. 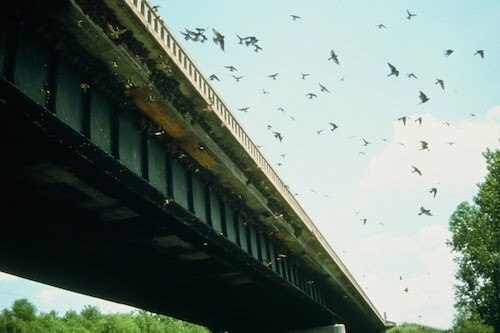 Barn Swallows build their mud nests under the overhangs of bridges, where they are safe from predators and have a consistent food supply from the insects that pupate or have a larval stage that lives in the water. When adult insects emerge they represent important sources of food. Barn Swallows have steel blue backs with a chestnut collar (throat area) and a pale underside. They often feed in flocks, especially when there is an insect emergence. Swallows have a deeply forked tail, which makes them very maneuverable in flight. Some studies have shown that female swallows like males who have extra long tails, which means they can do very elaborate maneuvers in flight. Swallows are important friends to humans because much of their diet is mosquitoes and other small biting insects. They essentially scoop insects out of the air with their wide mouths. It is possible that you may see Bank Swallows or Cliff Swallows in addition to Barn Swallows. Cliff Swallows build elaborate nests that look like little mud ovens with a chimney where the babies stick their heads out to be fed. 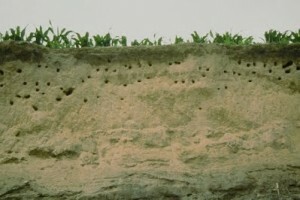 Bank swallows nest by digging holes into dirt slopes, but both of these species are more common in open country and are more likely to be seen on the Western stretches of the Kaw. Our thanks to Dr. Raymond Pierotti, University of Kansas, for this guide to the common birds of the Kaw.